Jura stroked his beard as he assessed the situation. "It seems I'm the tiebreaker again. Still, two very opposing yet valid points are made." He said so the council and Draco would hear him. Everyone present could hear the gears whirling and turning in his head as the Wizard Saint thought it over. Finally nodding Jura looked at Draco. "Draco you will be happy to know that your request will be granted. As it is your first participation in the games, and without your mask, then I shall grant this as a one time favor." He explained. Some negative groans on some of the members were heard as Jura spoke again. "However, Zeref will be in a private box monitored actively whilst wearing a magic nullifying anklet, to give us the insurance he won't try to escape again of course." That statement seemed to reassure the naysayers amongst the council. "Just refrain from telling your father, in case he decides to punch him." "Can't talk now. Too tired." And with that, Cain slammed his head on the table in exhaustion. "Why can't the games come sooner...?" Beltharion's spectral form appeared with a paper fan with 'Team Fairy Tail' written upon it, and was using it to cool down Cain. "Hang in there partner! We're gonna show the competition what for yet!" Draco nodded and said, "Thank you very much." Draco bowed respectfully before leaving with permission. Once Draco left the room Warrod said, "You know, I read that report on the one time he escaped prison and apparently it was because Draco had been possessed by the Demon King. He must have wanted to help his niece break free since it would be tough for Fairy Tail alone. It seems that the Black Wizard has a soft spot for little Draco." Draculos said, "Yes, and that was the only time he had ever tried to escape before. Let's just hope that he doesn't try again." Draco ran all the way home in about 10 minutes, no train rides or stops between. Draco ran up to the front door to see Natsu and Happy headed home from fishing and she slipped on the welcome mat in front of the door since she had been running too fast. Draco then skidded to a stop at Natsu's feet, a cloud of dust rising from the street where she had slid, she then said, "Hi Daddy. *cough* I just got back from training. *cough, cough* Sorry for making everything dusty, I was going a bit too fast so I slipped on the welcome mat on our doorstep." Draco would now be needing a bath since she was all dusty and sweaty. "So I see. With that amount of dirt your mom is gonna bust a vein if she sees you. Clean up quick before she does that." Natsu suggested with the twitch of his nose and began to raise an eyebrow suspiciously. "I smell hypocrisy. She's been at the council and also the Prison where 'big brother' is. I have a feeling he's wanting to watch the games real time and not on the Lacrima." The Dragon Slayer thought suspiciously. He set his mind to possibly interrogate her on it tonight. Or maybe tomorrow morning, if Lucy prepared something delicious enough for supper to make him only focus on food. Cain was walking down a dimly lit stone hallway, seeking something at the end of it. "Azura..." the chilling voice crept on him like a snake. He began picking up the pace. "You will not win this time.. your family is scattered, your ancestral Blade lost, replaced by a mere replica made by you." "You will fail, and Exphion herself will watch it as I gloat-Bro. You okay?" The voice changed into something familiar as something nudged his shoulder. Cain snapped awake with a gasp as he felt a metallic hand on the back of his shoulder. "Fenrir, sorry, dozed off for a second there. What'd I miss in this morning's chatter?" "Well I was gonna talk to Draco on doing a diagnostic check on my arm to make sure my increased strength during training doesn't destroy it, but it seems Natsu is asking some questions of his own." Fenrir explained, pointing at Natsu looking at Draco like it was a staring contest. "Draco, I know you talked to the council about something, the suspicion is to what extent? Is your uncle wanting something?" Natsu asked, trying to ask politely as per Happy's suggestion when talking about his own brother in front of Draco. "This is torturing me.. I wanna just slug my brother for wanting to watch but hey, he doesn't do anything. Maybe he's asking to watch cause he's bored." Draco was staring back at her father at the guildhall and said nothing as she sipped her root-beer. When Natsu asked why she had gone to the Magic Council and if it was because Zeref wanted something she spat out her soda on Natsu and started coughing as she laughed. Draco said, "No, not at all! I was the one who wanted him to watch in person. I mean I've participated in the games a few times but...this is the first year I'll be fighting without my mask... I wanted Uncle Zeref to see the games in person, I mean he doesn't have anything to do in prison except maybe mess around with the toy I sent him for Yuletide when I was a child." Draco had finished on a more somber note than when she had began. Lucy walked over and offered her husband a towel to dry himself from the soda that was spat on him. Natsu didn't expect to have root beer spat in his face as part of a spit take. Natsu had an almost surprised look at what had just occurred to almost miss whatever Draco said next on the subject. Almost everyone present at the guild hall, including Cain, were in shocked silence. "Oh, so you asked huh... here I'd thought the beaurucrats wouldn't think twice on-blech!" Natsu was interrupted by Happy almost slapping the towel Lucy had onto his face. Whatever came out of Natsu's mouth was all muffled. Cain, sore from his recent workouts, and tired from his sleep depriving nightmares, finally couldn't help himself anymore, and laugh. He laughed so hard even Fenrir looked at him oddly. "Uhm, bro? You okay over there?" The Silver armed Wizard asked. Cain began to pant really hard from his fit of laughter. "I'm-hehee-alright Fen, it's just the root beer then the towel...it made my week." Cain said before resuming his fit of laughter. Natsu shot a deadly glare and resolved to deal with him after he finished what he wanted to say. "Well, I suppose I have no choice but be okay with it. But don't make me sit next to him." Natsu said, harrumphing as he turned his attention once more to team Fairy Tail's weakest link and forming a fireball. "Hey Azura, let's test your reaction speed." "Oh no run Cain!" Happy shouted as Cain finally realized the danger. His laughter slowly lowered to a nervous chuckle he got up and started to run. "Come back here you dragon slayer wannabe!" Natsu shouted. Beltharion, having heard this, popped up to protest but stopped at seeing the fireballs. "Run for your life laddie! Run run run!" The ghostly dragon screamed. Fenrir could only gawk at what was happening before looking at Draco. "First time he so much as smiled since the start and your father decides to use him as target practice..." he commented. "Gray! Why aren't you stopping this?" "Why should I? This is like watching a show." The ice wizard said with a smirk but then realized he lost his shirt before going to look for it. His adopted son could only shake his head and hoped Gray would never go senile when he got old. Draco nodded when Natsu started talking about the bureaucrats not thinking twice but had been interrupted by the towel. Draco could guess what he was trying to say about them and said, "It was a one-time favor from Jura since he was the tiebreaker for the matter." Draco helped dry her father off through Cain's laughter and heard Natsu say that he didn't have a choice but to be okay with it and not to make him sit next to Zeref. Draco then said, "Don't worry. He won't be anywhere near you. I wasn't actually supposed to tell you but you figured it out just by the scents that were on me yesterday." Draco watched as Natsu got up and prepared to attack Cain and heard Fenrir's comment. When Gray decided he wouldn't try to stop it, Draco got up to get someone who would. Draco hadn't used the method since before she started talking again and she figured she would remind the guild that it existed. Draco walked over to a cowbell and rang it so that Master Erza would know somebody's fighting. Draco watched as everyone in the guildhall froze at the sound. Draco then put the bell back and walked over to Cain who would be confused by the reaction. Draco said, "It's my personal way of letting the Master know that there's a fight getting out of hand." Draco then sat down and finished her root-beer soda. In less then ten seconds after bell was rung, an armored fist hit Natsu square in the face as Cain watched dumbfounded as Erza scolded Natsu for fighting in the guild hall. "I'm very sorry." Natsu said in a dizzy state, at which Cain forced a chuckle to stay down his throat. "I see, interesting system, anyway, gotta train!" Cain stated as he jogged out of the guild hall putting his training device on as he went. "Y'know Cain, Since you and I are the same age, what do you think the odds are of me facing competition for Draco?" Oscar, who was waiting for him asked. The training Wizard stopped short of his jog and turned to look at his cousin. "What's with the look, don't tell me you've gotten attracted to her as well?" Oscar slowly began to back away. "Come on I wouldn't dream of openly flirting with her in front of you.... that doesn't help me." Oscar realized too late as the last thing he saw before sky was Cain's fist slowly taking in an emerald green fiery aura hitting his face sending him there. "Nice hit laddie!" Beltharion shouted. "Great, now this love triangle has turned to a rectangle..." Cain muttered, bemoaning the new competition he had to deal for Draco's heart. Draco wasn't sure what she was going to do for training today. Draco could visit her Uncle and tell him that he would get to see the games in person this year, or she could train her speed and power, she could also go to her lab and write up the analysis of the current training data from the vests. Draco's train of thought stopped at the lab and she remembered that she was close to finding a way to break the curse. Draco finished her root-beer and got up to head to the cave where her lab was, she needed to work on the spell to break Zeref's curse a bit more and as long as she didn't cast it on Zeref once it was done, she wouldn't die. Draco had been working on the spell for about 3 hours when she finally got a solid breakthrough, everything else seemed to fall in place after she figured out the most difficult part of creating the spell. Draco was breathing heavily as she finished writing everything down, the spell was now complete. Draco still wasn't sure what she would do since lifting the curse meant death for her but she decided to wait until the Grand Magic Games had come and gone before she made any serious decisions. Draco put the spell in a safe that she had bought to protect her finished spells and left the lab after locking everything up and sealing off the other rooms with her Crystal Magic. Draco then left the cave and hid it once more before heading home. As Draco headed home she bumped into Cain and someone else she didn't know. They looked to be taking a break from training. Draco said, "Hey Cain, who's your training partner?" Draco smiled kindly at Cain and the other teen. Draco felt Draconius trying to sneak up on her by melding into the shadows. Draco said, "Draconius, I want you to stop whatever you're planning to do and ask yourself this, 'Am I willing to get punched in the face today?" Draco could hear the demon sigh and emerge from the shadows, "You're no fun." Draco replied teasingly, "No, no I'm not." The teen would probably be surprised to see the Demon of Corruption in a place like this and not trying to kill anyone. Draco's bond with the demon wolf wasn't known by the public and most of the other ally guilds didn't know about it either. "Uncle helped plan this didn't he?!" Cain accused Oscar as he looked worn, tired and overall mad at the tortuous routine the latter gave to his cousin. "Maybe, but my father only has the best interests at heart." Oscar explained as both heard a voice and looked up. Cain immediately recognizing its owner. "Hey Draco. This is my cousin Oscar. He-" Cain was interrupted when Oscar flourished and bowed. "Salutations, It is a pleasure to meet with the Crystal Dragon, I am the Jade Wizard from one of the Harbor towns in a more quiet guild." Oscar explained. "I heard from a grapevine my cousin was going to be in the tournament. So here I am, training my cousin, meeting the local ladies, et cetra." Cain sighed and gave a wave to Draconius when he appeared. Already Oscar was trying to flirt. Problem was it was Draco, and he already had Sting's son to deal with! This and he had to train for the tournament! Draco chuckled as Oscar flourished and bowed after Cain introduced him as his cousin, before doing his own introduction. Draco said, "It's very nice to meet you. And it's always nice to meet more relatives of Cain and Fenrir." Draconius rolled his eyes as yet another man was flirting with his master. Draco said, "I'd best get to my workshop, there are some things I want to do before I go to visit my Uncle in prison." Draco then said to Cain, "See you later." Draco ran off to go to her workshop but Draconius stayed behind and scoffed, "She's still insisting calling that mansion she has held art shows and works on her many artistic projects a workshop? That place is too fancy to be called a workshop, even if there are many rooms filled with craft materials and tools and finished pieces." Draconius then merged with the shadows and said, "Have fun training Cain." Before going to the dimensional plane he called home. At the workshop, Draco had made some sweets for Zeref as well as apple spice tea to drink while they talked. Draco ran all the way to the prison and the warden greeted her warmly as she presented him with some tea and sweets as well to thank him for his hard work. Draco entered the cell and said, "I'm back to visit again Uncle Zeref, and I brought some tea and sweets again." Draco poured them both a cup of tea and allowed Zeref to pick first out of the sweets. Draco said, "So there's good news and there's bad news. The good news is that you'll be allowed to watch the games in person this year, the bad news is that Daddy found out I had visited the Magic Council yesterday after I visited you because I didn't make it home in time to wash off the scent. So Daddy knows as well and let's just say he wasn't happy." Cain could only groan. ”Why did you leave me alone with him Draco?” he thought miserably. The Dark Wizard gave his niece a curious glance. He hoped she did have a plan for the tournament at least. Draco smiled as Zeref joked about how much she visited him before commenting on her father's displeasure about him watching the games in person and said, "Well, then maybe I should visit you more for good luck in the tournament. And Daddy needs to learn to let go, that's in the past. The past is past, this is now. If Daddy wants to keep complaining about you watching the games, then he can kiss my *** because I asked the council to let you watch the games." Draco covered her mouth when she realized that she was showing her Uncle the foul language she sometimes used when joking around. Draco said, "Sorry about that." Draco listened as he talked about how he would probably be under guard at the games and she nodded to let him know he was correct. When he mentioned how the council probably realized that he could escape anytime he wanted she smiled a bit and said, "That was a special case last time, and they probably figured that out too." When he asked her about training strategies for the tournament Draco said with a calm smile, "Oh yeah, I have plenty. I even worked out training regimes for the other members of the team to strengthen their strong points and their weak points, along with suggestions on foods they can eat for meals and snacks to help them keep up with the training." Draco proceeded to tell Zeref about her many strategies for training and even for possible events that may be included in the GMG, some were elaborate with many sub-strategies in place for possible problems that may arise when executing the plan, some were as simple as hit-and-run tactics, but all were very well thought out. Draco was obviously enjoying the time spent with her Uncle, she was happy to converse about everything with him from battle strategies to her research and art to even the daily occurrences in her life. Draco often lost track of time when talking to Zeref and sometimes got home late at night because the warden had allowed her to stay longer since he enjoyed her visits as well, even if it was only to talk to Zeref. He liked the fact that he could brighten her day just by making exceptions once in a while by extending visiting hours for a day just for her since she was the only one who visited the prison, other than the occasional council messenger and legal figures. Today was another such day as the warden knocked on the door to say, "Draco, you'd better get going. Visiting hours were over almost 3 hours ago and my shift's almost up." Draco's eyes widened as she said, "Really? I'm sorry, I lost track of time again. I appreciate you letting me stay this long." The warden replied, "It's not a problem. I'm sure Zeref enjoys the company. You're always welcome here in my book." The warden gave her a thumbs up and a grin. Draco turned to her uncle and gathered the empty cups and put them in the equally empty basket before saying to Zeref, "Bye Uncle Zeref. I'll come visit you again soon." 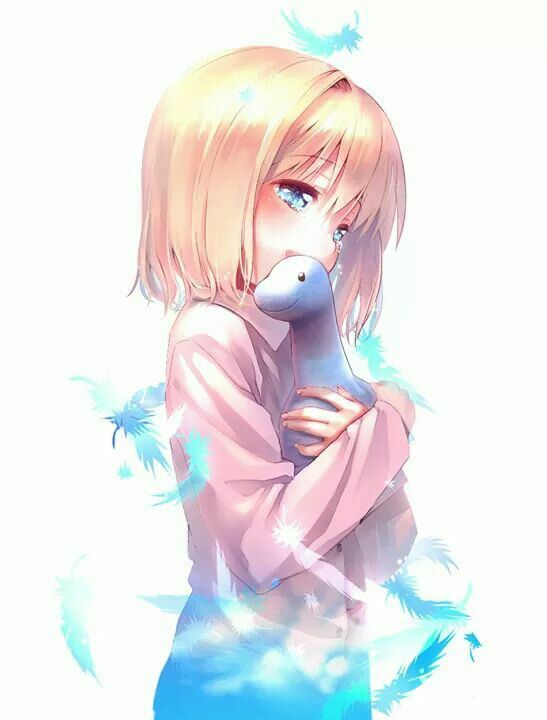 Draco hugged her Uncle before leaving the prison to head home. Once outside Draco noticed that her watch read 1:33 AM and she said to herself, "Daddy's gonna kill me when I get home." The warden closed the prison door behind Draco but opened a metal hatch that was used to talk to the prisoners without opening the door before he said to Zeref, "The council also sent me some forms to let me know that you'll be watching the GMG this year. I'm sure you're as excited to see it as I am, your niece is a really special girl if she can get the council to agree to that. Honestly, her visits are the best part of the day since it gets pretty boring around here whether you're a guard or a prisoner. It's nice to see how much that kid cares about you." The warden then walked away humming, he remembered how skeptical he was when Draco came to the prison at Yuletide for the first time saying she was there to visit Zeref but he was glad that Draco would visit her Uncle frequently since it made Zeref happy despite his imprisonment. As Draco opened the front door of her home at around 3:45 she wasn't surprised to see her father sitting in his favorite armchair in the living room with an irritated look on his face due to the late hour at which she had arrived. Draco said, "Sorry Daddy, I lost track of time talking to Uncle Zeref again. No, I didn't go partying in another town. I got hit on by a 40-year-old man but he was just really drunk and mistook me for his wife, luckily he sobered up really quick after tripping over a bucket of water that had been left a little too close to the sidewalk and he apologized a lot." Draco already knew by heart the questions Natsu would ask her when she got home really late so she saved him the trouble this time. Draco knew that her father was jealous of her Uncle since she visited him often, but she didn't care since she knew that was only because he still hadn't forgiven her Uncle for the past. Zeref listened to his niece speak of how she planned for the tournament and the training regimes for her team and nodded with approval every now and again to show he was still listening. When it was time for her to leave, he was a bit astonished at how far time flew by during the visit, but due to his immortality, it shouldn’t have been too surprising to say the least, as he had to get used to time passing quicker then he. He didn’t expect a whole day to fly by right under him though. At the Warden’s statement he smiled softly. “Yes, it does make life here all the more bearable. Makes me wonder how She will behave when she’s all grown up, with children of her own.” He said, musing at the potential of being a great-uncle. At the Dragneel Residence, Natsu observed his daughter coming in. “I expected you to be there instead of training like you should, Why would you party in another town, WHAT?! Do I have to burn him for that! !” He shouted the last part at the top of his lungs, a small spout of flame emerging from his mouth. “Also, where did you find the time to sass me like this?! And I know you got it from you mo-“ just then, a fish slapped Natsu in the face, sending him falling into the couch and the scent knocking him out cold. The user of said fish? A certain blue exceed who looked like he got disturbed from his slumber. “Natsu... keep it down, I wanna fish tomorrow and you’re ruining my strength building to find a big one.” The exceed complained. “At Least She isn’t sneaking a boyfriend home or something be grateful for that.” With that, the exceed slowly spreads his wings and flies back towards where he sleeps in the nighttime, curling up to go to sleep. “Gotta recount the fish I’m dreaming of... one....two...” Happy sleepily mumbled as he drifted off. At the guild hall at around 7 am, Cain was there early... or was he there late? He was so sleep deprived from Oscar’s training routine he couldn’t tell which. “Man... now I remember why I struck out on my own to find Fenrir.. I just hope I can catch at least a few more z’s...before anyone shows up...” with that statement said his head took a dive forwards and his forehead met the table with a resounding bang. Moments later there was the sound of snoring emanating from the slumped form of Cain, which left a Just now arriving Gajeel all the more confused... and mischevious as he smelled an opportunity for a prank... so he pulled out a black marker and drew a pair of glasses and a moustache on the poor sleeping half brother of his adopted Nephew. “Hehehe, Fen will get a kick out of it that’s for sure, used to prank him the same way I remember.” Gajeel thought with a snicker. Draco laughed as her father got smacked in the face with a fish, it was a rather amusing sight. Draco replied, "I've always sassed you, you just never heard me say it out loud before." Draco knew her father had been knocked out and couldn't hear her, she just felt like saying it. Draco started to head towards her room but her vision blacked out for a moment and she barely caught herself before she fell, her vision quickly returning and allowing her to stand back up. Draco said to herself, "That was... odd. I must not be getting enough sleep." Draco then prepared for bed, hoping that tomorrow's training would be productive for her. The next morning, Draco had gotten up and made breakfast for her parents, Happy, and her brother. Draco also made a little extra to bring to Avorna, she knew it had to be boring in the Guild's dungeon. When Draco arrived at the Guild she noticed that Gajeel had drawn on Cain's face. Draco rolled her eyes in exasperation and headed down to the dungeon where the white haired demon resided. Draco said, "Good morning Avorna, I made you some breakfast." Draco passed the container holding the meal through the bars as she looked at his wounds. Draco said, "It looks like you're almost completely healed, that's good. Hopefully you'll soon heal up completely. I'll let you out of here once you're completely healed." Draco smiled at the Demon, it was obvious that she was being serious when she said she would let him out once he was healed. Fenrir, upon walking in and noticing his brother’s state, decided to chuckle a small bit as it raised memories of back in the day in which his time with some of his Former team, before the incident that took his arm away. He felt the familiar, tingling sensation of phantom pain on what remained of his shoulder. ”That was a simpler time.” he thought to himself. 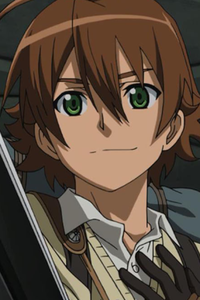 He was happy to be somewhat of a co leader of the new team he was on in the same guild that brought him up as a child. Still smiling he went to go get his coffee, leaving an unassuming Cain to his hard earned slumber. “I’ll wake him up later before it turns noon.” He affirmed. Avorna, still recovering from his wounds, silently regarded Draco and simply took the food and ate. “Out There? With Them running about waiting for me to slip up my next disguise? I’d be a goner the moment that happens. Especially with that...” He then shut his mouth, mostly due to the good food now in his mouth, and some due to the fact that he felt spilling the beans got the demon in trouble and leading him to be in this predicament. “You’re too kind for your own good child.” He simply said, continuing to eat his meal. Draco shrugged and said, "Well, I do have an art workshop that you are welcome to stay at until you feel safe enough to go on your way, or you can settle down there perminately if you want. It's got a fully stocked kitchen and a lot of places to hide or relax, as well as many things to do." Draco didn't pry into anything that Avorna may have been hiding from her, she wasn't there to interrogate him nor did she want to. When he told her that she was too kind for her own good Draco just smiled at him and said, "I get that a lot." Draco sat down and said, "I am often called foolish as well. Especially when I talk about how I want to create a world where all creatures can live in peace, be they, human, dragon, animal, God, or even demon. A place where demons get to choose what they get to be in their lives just like humans and other creatures do. Demons wouldn't automatically be forced or expected to do bad things just because they are demons, they would get the choice. Everyone thinks it's impossible but I don't think that's true, it'll just be difficult. But since it'll be difficult, I think it will be all the more satisfying when it's finally accomplished." Draco knew her dream probably sounded foolish to the demon, but she truly did believe it was possible for that world to exist. Kurai entered the guild hall yawning. He had pulled an all nighter working on his manuscript due to an intense stroke of inspiration that he had. Kurai knew that he probably looked like a trainwreck as he walked up to order a cup of coffee, something he only drank when he was completely exausted. Kurai then nodded in thanks as he took his coffee to sit at a table nearby. Kurai downed his coffee in a single gulp before he sighed, he really needed that. Kurai said to himself, "Where did Draco go? That kid gets up to all kinds of trouble." Kurai chuckled before he thought, "I need to tell her who I really am soon, and about my past with Exphion before it's too late and she finds out on her own." Avorna fought very hard not to gag at Draco’s dreams. They felt more like Exphion’s promises that she never could truly keep. “Demons are demons. But if you truly think you could bring that world about I’d like to see you try.” He said, “As for your.. offer, is there a loft or someplace I can just set up a hiding place in this...studio of yours? Cause... yeah. Gonna need to find a better human disguise.” He then returned to gobble up any food left over from his breakfast as he waited for a reply. Avorna’s mentality towards Draco, and By extent Exphion was to not trust her. Such a perfect world did not exist. Not in this world. Not nobody, not no how can claim otherwise. Upstairs it started to get rowdy when Cain woke up and began a usual routine, not sure what everyone was laughing at. When he got to his brother he heaved a sigh. “It most certainly isn’t! When I confront whoever did this I’m going to-“ Cain’s angry rant was cut off by the clearing of a throat as he turned to see two Very Menacing looking Dragon Slayers. Gajeel and Natsu stared Cain down like a hawk to a rabbit. With this, the young man swallowed nervously and began to think up a quick lie on the threat. “Give them a good morning hello and a friendly chuckle!” He finished as he looked around nervously then back at Fenrir. “I’m not gonna last five minutes in the tournament if I put up with Oscar’s training or these antics!” He whined as he face planted onto the table. “There there brother.” Fenrir said patting him. “You’ll be ready. Oh morning Kurai.” He gave the elder Dragneel sibling a wave before dealing with a freaking out, and half tired Cain. Draco could tell Avorna found her dream ridiculous, like many others, even though he was trying not to gag at her words. Draco listened to his words and said, "I most certainly will try, only death will stop me. Unless I really am a Goddess like everyone keeps saying, then I'll probably keep trying for eternity." When he asked about the studio and if there was a loft or something that he could set up a hiding place in, Draco smiled and said, "Yeah. There's an attic where all the animals that lowered the property value live since I let them stay too, not sure if you'd be comfortable with them though. There's also several empty rooms on the 3rd floor that I still have no clue what I'm going to do with. You could have your pick out of the rooms." Draco took the empty lunchbox from Avorna and said, "Some of them might be dustier than others but I'll probably clean them before training for the tournament today." Draco stood up and lost her balance for a moment but she quickly caught herself before it was noticiable. Draco then said, "I'll come back this evening if I can, I'm sure it's boring down here by yourself. See you." Draco left the room with a bit of pep in her step, feeling like she was getting somewhere with the Demon of Hatred. Draconius emerged from the shadows outside the cell and said, "I heard her telling you about her dream to create a better world. You think it's ridiculous too, right? And you're probably wondering why the former Second-in-Power Demon would betray the Demon King and side with Fairy Tail over my own kind." The demon wolf listened to Avorna's reply and transformed into a much more human appearance before leaning against the wall, he started, "Well, for most demons who betray the Demon King it's that they were offered something valuable enough that it tempts them to betray, no matter how highly ranked the Demon. My reason isn't so simple." He turned to look the caged Demon of Hatred directly in the eye and said, "She actually inspires me to do better without even knowing it, she makes me feel...human... I want to see her dream come true." Draconius sighed and turned his gaze away from Avorna as he spoke, closing his eyes as he said, "One thing that I have learned from watching this kid grow up is that if she sets her mind to it, she can make the impossible into reality. I truly believe that her dream will come true, nothing is impossible for her." Draconius knew that hearing those words coming out of the Demon that was Second-in-Power to the Demon King, the Demon of Corruption, would probably be disconcerting for Avorna to say the least. Afterall, anyone who knew the old Draconius, a demon that didn't hesitate to cause choas, destruction, and death, wouldn't be able to ever imagine such words coming from his mouth. It was obvious his time with Draco had changed him greatly. Kurai watched the ensuing chaos and stood up saying, "I'm going to have to get more coffee to deal with this mess today." Kurai returned Fenrir's greeting tiredly as he walked to the bar to order another cup of coffee. He was so tired that he almost missed seeing Draco walking back up from where they were keeping Avorna. Draco saw Cain's face and walked over to Natsu and Gajeel before saying, "I'd know your handywork anywhere Uncle Gajeel. I'm going to ask for a favor from both you and Daddy. Don't prank Cain anymore, the poor guy is already exausted from training, I can see the dark circles from here. Just give him a break, he needs all the time he can get to focus on preparing for the GMG instead of cleaning up whatever mess is leftover from your pranks on him." Draco walked over to Cain and gave him a sheet of paper that had a workout regimine she developed for him that would be much more effective than the Spartan training he was recieving from his cousin, it even included a diet that would best support the training and a detailed schedule for the amount of time he should spend on each exercise and how many times a day he should do them. Draco said, "Show this to your cousin and tell him I said that the Spartan training approach doesn't work for everyone, sometimes it causes more damage to the body depending on the person and actually has the opposite effect over a long period of time. Trust me Cain, this worksheet has a training routine that I think would be much more suited to you than what he has you doing right now, even if some of the exercises are the same as what you're already doing, you'll also be more well rested and have more energy." Draco patted his back and said, "Also, I think you should take the day off from training, anything done while you're basically running on naps and practically a boatload of coffee is going to have the opposite effect because your body will be screaming at you to stop." Draco gave a nod to Fenrir as she turned to leave the guild but was stopped by Kurai saying, "Draco, I need to speak to you about something. It's really important." Draco looked at Kurai confused and said, "Okay, but I was going to head to my studio to clean some of the empty rooms since they're really dusty and I offered to let someone stay there until they have somewhere else to go." Kurai nodded and said, "I can help you out and we can talk after we're done cleaning. We haven't really been able to spend time together by ourselves lately, I know I missed hanging out with you." Draco replied eagerly, "Okay, let's go then!" Draco then turned to run towards the door, tripping over a loose floorboard when her vision started to blurr a bit, Kurai caught her and said, "Careful, that floorboard still hasn't been fixed yet." Draco replied with embarrassed laughter, "Right, I forgot about that." Draco then walked next to her brother as they left the guild to head to her studio. Avorna’s looked at Draconius with shock and incredulity. He, the Demon of Corruption, a high demon of rank, moved by A human’s goals in life. “You have changed Draconius. It’s not like you to be moved by a human.” He remarked. The demon turned and tried to weigh in on the words of the individuals heard. “I’ll help to explain. A little chrome muscle oughta help out hm?” Fenrir interjected with a chuckle as he flexed his metallic arm. He watched as Draco tripped and both he and Cain noticed with corncern written on their faces. Natsu noticed as well, and decided to for now observe and see if Draco herself was tiring herself out. Interventions will come if needed. As a father he had that right. Fenrir ushered Cain to his room and heaved a sigh when he did. “Maybe now he will rest and not complain for awhile.” He said, further thoughts interrupted by a desire to have a few moments to relax on his own thinking Moriko was on an errand. He took off his prosthetic, and sat against his armchair by the fireplace, musing about the tournament. ”Well, I’ll just take the day off as well. If only to make sure my brother doesn’t try to train on his day off.” he thought, giving himself a silent groan as his phantom pains came again. Sometimes he wondered if losing his arm was worth the pain. And whether the pain was worth the price of the lesson of failure. He had to move forward though, as the tournament was coming. A free trip to the capital was always nice. Visiting Sabertooth is just as nice. So the Wolf sat, and mused and listened for any movement from Cain’s room. Draconius chuckled at Avorna's reaction and said, "A funny thing, how one such as myself, who used to be close to equal rank with the Demon King, has been changed by this one girl. If my younger self saw me like this, I'm sure I would be just as shocked as you. I had been imprisoned for thousands of years and the Gods told me that if I wanted my freedom back, I had to make a contract with Draco, protect her until she died naturally, and I would allowed to roam the world and do as I please. I took them up on that offer since that meant I could cause destruction and chaos wherever I wanted to if I fulfilled the task. When I actually met her she had the strangest reaction. She knew exactly who I was, what I was, and she showed no fear. This child who had been bruised, broken, and beaten was able to look a powerful demon in the eye without any fear at the age of 6. It took me 2 years to get her home and she taught me many things without even realizing it. I remember one time she had gotten attacked by someone who was trying to kill her and she managed to talk the man down, despite being a wanted criminal that was out for blood she calmed him, listened to him, even forgave him with a smile on her face. Then he willingly turned himself into the authorities. I questioned her reasoning and she simply told me that just because people do bad things doesn't necessarily mean they're bad people, she even went so far as to say she thought that demons were the same in that regard. I think that was actually the turning point for me." Draconius looked at his hand and said, "It's almost like the Demon of Corruption is being corrupted by the light, I feel like I'm more human than demon now." Draco and Kurai had been cleaning the workshop for a few hours and were resting on a couch in the lounge now that a few of the extra rooms had been cleaned up and fresh sheets were on a large kingsized bed in one of the rooms she planned on letting Avorna stay in. Draco said, "Kurai-nii, you said you needed to tell me something?" Kurai sighed and leaned back against the couch as he looked up at the cieling saying, "Yeah. It's gonna be a long story and it's probably going to take a while to finish but it's something I feel you need to know about me." Draco scooched a little closer and replied, "What is it?" Kurai took a breath and said, "Well, first of all, I know that you're invested in learning about demons since many of the harder to break curses are from Demonic origin. I'm curious, how many demons do you currently know of?" Draco replied, "I know of a lot of demons, obviously Draconius, the Demon of Corruption, Avorna, the Demon of Hatred and Malice, Oenoinoch, the Demon of Poison and Pollution, there's also Krashath, the Faceless Demon, Garulan, the Demon of Gluttony, Erinol, the Demon of Greed, and a lot more high ranked demons that can be easily found in historical documents if you know where to look." Kurai nodded and asked, "Did you know that Draconius is actually the 12th Demon of Corruption and Avorna was the 58th Demon of Hatred and Malice?" Draco nodded and said, "Even though they age slower than we do, Demons do lose power as they get older and eventually the ones with high ranks need to train younger demons to take on the title they once had." Kurai looked at Draco out of the corner of his eye and asked, "Do you know who the predicessors for some of them are?" Draco nodded and stated, "Avorna's predicessor was known as Garfornel, who had to train several young demons to take his place, he was the 15th Demon of Hatred and Maice and the reason there have been more Demons trained to take on the role of the Demon of Hatred and Malice is because many of them got themselves killed because of their hatred driving them to reckless behavior. I think the name of the Demon of Greed's predicessor was Alforn, Krashath is a demon who's rank was more recently created so he didn't have a predicessor, Garulan's predicessor was Higranelo, he was the 27th Demon of Gluttony, and Draconius's predicessor was called... Keltos, I think?" Kurai then slowly sat up and said, "Alright, let's focus on Keltos. What do you know about him?" Draco replied, "Honestly, not much. A lot of the documents about him were lost or damaged over time to the point that all anyone really knows is that he existed." Kurai replied, "That's because Keltos was banished by the Demon King and branded a traitor before he died." Draco looked at Kurai and asked, "Kurai-nii, what do you know about Keltos?" Kurai chuckled and said, "A lot more than most people do. I figured I'd tell you the story of Keltos if you're interested." Draco nodded and scooted closer to the point that she would be in his lap if she tried to get any closer. Kurai chuckled and said, "Alright. I guess we should start with what got Keltos banished since that's really the only interesting part of the story." Draco nodded in understanding and waited for Kurai to begin. Keltos was frustrated, the Demon King had sent him on a scouting mission into enemy territory to find the Goddess of Kindness, Exphion, and he got ambushed by the God's weakest soldiers when they saw him alone thinking they had a chance to take down one of the Demon King's Generals. It had been easy to take down the soldiers, they were fools to think they stood a chance, but one of them had managed to get a lucky shot in and now he was unable to go report back to the Demon King due to a Sacred Shackle that he couldn't remove. Keltos mulled over his possible options, it was impossible to break it since it was made specifically for trapping demons, he could call for Draconius, the demon he was training to one day take his title when he was much older, he could also cut off his leg, but that one was going to be more of a last resort and Draconius would never let him live it down. Keltos was brought out of his thoughts by the snap of a twig. He growled, "Show yourself and I won't kill you for hiding." Who did he think he was kiding? It was such an obvious bluff, the Sacred Shackle prevented him from using any magic and he could only attack an enemy if the got close enough for him to rip off their head, but nobody would be stupid enough for that. 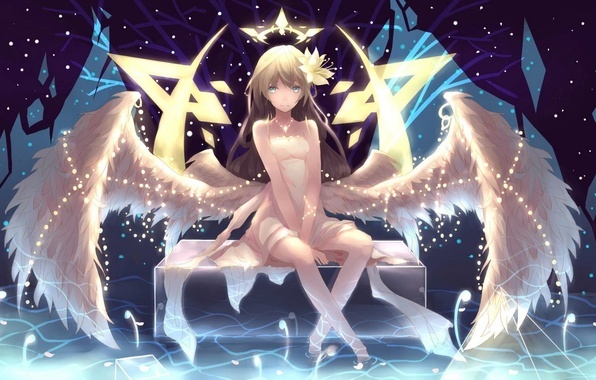 However, he didn't expect for them to obey him, nor did he expect it to be a young Goddess with golden wings that seemed to have gotten lost. Keltos glared at the child and said, "You better get out of here before I kill you." The young goddess stared at him for a moment before she smiled sweetly and removed the Sacred Shackle from the demon. Keltos stared at her and said, "You know it's not a good idea to free a demon who could kill you, young Goddess." The small girl replied, "Maybe not but you needed help. I'm Exphion, what's your name?" Keltos seemed shocked by the child's reply, he was supposed to locate Exphion and she found him instead, she even freed him despite it being obvious that he was a demon. He simply replied, "Keltos." 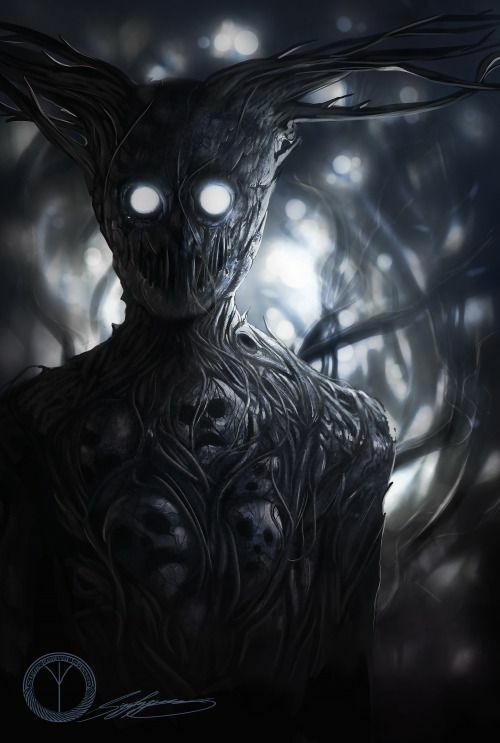 Exphion smiled and said, "It's nice to meet you Keltos, Demon of Corruption. Will you be my friend?" Keltos had been prepared for many things on this mission to locate Exphion, death, traps, and even finding nothing, however he was not prepared for his target to ask for friendship. Keltos was drawing a blank on what he should do but he slowly replied, "Sure..." Exphion seemed excited and proceeded to hug him before saying, "I gotta go, my big brother is probably looking for me. Let's meet here again tomorrow, bye!" Before running off into the woods, leaving Keltos staring dumbfounded after her. Keltos didn't know why he was there again, he had reported that he didn't find Exphion and that he would go out again to scout further. Keltos had been tempted to tell the Demon King about the fact that Exphion wanted to meet him today but he had decided not to, he was intrigued by the young Goddess's strange behavior. He found himself standing where Exphion had found him yesterday, he was fully prepared for the possibility that it was a trap, but Exphion showed up alone and tackled Keltos with a hug laughing, "You came back! Let's play!" Keltos found himself being dragged to a lake to play in the water with Exphion. He couldn't understand what was possessing him to humor the young Goddess, but he tolerated her presence. Keltos had continued to meet up with Exphion for years, watching her grow older and become a beautiful and powerful Goddess. He even began to develop the desire to protect her, often treating her as a younger sibling. However his meetings with the Goddess had been discovered and reported to the Demon King. Keltos had been gravely injured and had a curse placed on him that would ensure his death, not even Exphion would be able to save him. Keltos had met with Exphion and said, "I'm glad I got to see you...one last time Exphion." Exphion began to cry, "Keltos, I may not be able to heal you, but I am able to take your soul and preserve it long enough for me to create a body for you so that you can be reborn." Keltos smiled and said, "Then if that's the case... I want to be born as a human, I want to have the choices I couldn't have as a demon... I know that you plan on becoming mortal to try and break the curse your brother placed on Zeref... So I want to be your elder brother in that life..." Exphion nodded and said, "Very well...But you'll lose your memories of your life as a demon until I am mortal as well." Keltos sighed contentedly, "That's fine..." The next thing that happened was darkness overtaking him as he died and his soul was preserved. Draco stared at Kurai in disbelief as he finished his story. Kurai said, "It's been a long time Exphion." Draco was in shock and eventually asked, "You're Keltos?" 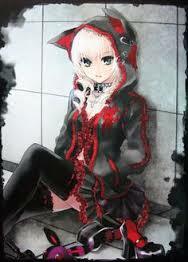 Kurai nodded and said, "In human form, yes. I've wanted to tell you for a while but I wasn't sure how or when I'd tell you. I felt that you were the only one who needed to know who I used to be, afterall, you're the one who gave me this life. This chance to be happy, one that I wouldn't have as a demon as long as the current Demon King reigns." Draco looked up at Kurai and asked, "Does Draconius know about it?" Kurai nodded and scratched his cheek awkwardly as he said, "Apparently he knew from the moment he saw me. Just like how I got my memories back the moment I saw you in mother's arms." Draco sat quietly for a moment and said, "That doesn't change that we're brother and sister. The past is past, this is now." Draco gave Kurai a smile and he found himself smiling back as he put his arm around her. The Dragneel siblings sat together in comfortable silence, enjoying each other's company without the need for any more words between them in the moment.